TBILISI, DFWatch–The House of Justice in Tbilisi was Tuesday evacuated as a result of high winds which damaged the roof of the building. No-one was injured, but the building remained evacuated throughout the day. 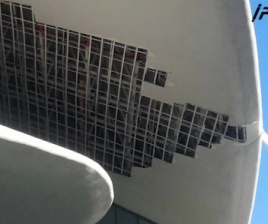 The roof was damaged at the entrance of the building, where pieces of plaster fell down. Emergency workers arrived to the spot in order to organize the evacuation and examine the building. The Minister of Justice remained inside the building. She wrote on her Facebook page that almost all the employees and civilians were taken out and only a few persons, including herself, remained inside. She wrote that no-one was injured. “Representatives of the Italian company, which last year mended the roof in surprisingly short time, will arrive in Tbilisi tomorrow,” she added. Transparency International Georgia responded to the incident in an article published on the organization’s webpage which said that the roof of the House of Justice cost 10.3 million euros and was constructed by the Italian Company Permasteelisa Interiors s.r.l. According to information gathered by TI Georgia, the construction of the House of Justice began on 1 March, 2012, and finished 6 months later, on 30 August, 2012. “The contract suggests that the warranty period for the roof expired recently – one year after the preliminary handover of the works by the company, which probably took place around the opening of the building in fall 2012,” the organization writes. According to the construction contract for the House of Justice, it cost USD 61 million and was built by Huachuan Georgia Ltd, a Chinese state-owned company. Bad weather caused problems in all over the country Tuesday http://dfwatch.net/bad-weather-in-georgia-power-cuts-road-closure-94788. A school and a kindergarten were evacuated in downtown Tbilisi, due to gas pipe damage after a tree fell on it. The gas started to leak and locals called for the emergency service. 15 000 households had their natural gas cut due to the incident all Tuesday. 20 000 out of 70 000 households who were without electricity Tuesday are back online. Technicians for Energo-Pro Georgia are still working to restore electricity supply to the remaining households, but the bad weather is slowing down their work. A flight from Batumi to Istanbul at 18:00 on Tuesday was cancelled due to the weather.